Permanent magnetic chucks type PMNP, extremely strong panels for millwork, even with a large air gap. 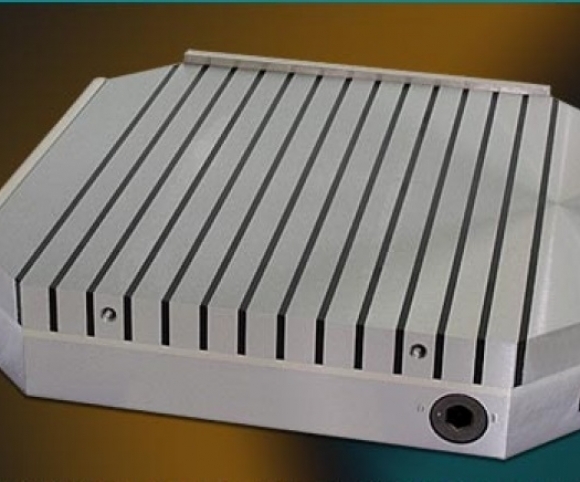 By a double-ND high energy magnet system and a 15 +4 mm pole pitch NP panels reach maximum holding forces even with poor surfaces. Workpieces from 40 x 20 x 8 mm can be clamped for milling. On top of the 15 mm steel poles pole blocks can also be constructed to indemnify the workpiece or contribute to pockets and holes in the magnetically active region. The solid base provides sufficient room to receiving elements for palletizing or for zero point clamping systems.